Eight years ago on the 8th of December 2003, I wrote my first blog at http://akin.blog-city.com it presented an opportunity to gather me thoughts about a whole range of issues and publish them as a journal and an opinion column. Over those 8 years, I have seen bloggers come and go, some engaging, some disparaging and others who should not be let near a keyboard for reasons far too many to mention. Blog-City served me well, until August 2010 when they decided they could no more run the blog service because of other commitments. Since then, I first simultaneously published blogs on http://akin.blog-city.com and http://akinblog.nl whilst literally copying my blogs one at a time from the old site to the new. 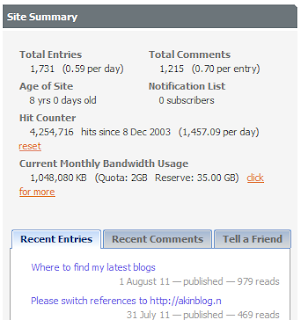 My last blog at Blog-City was published on the 1st of August 2011 and the blog is set to close on January the first 2012, however, I must celebrate the 1,731 blogs posted, the over 4,250,000 hits and 1,215 comments on a whole range of subjects for which I have received accolades and brick bats. Now, everything happens on http://akinblog.nl and I want to thank all my readers, fans, the linkers, the people who have left comments and most of all, the many friends I have made by reason of their reading my many stories of sadness, joy, childhood, anger, rights, sickness, survival, trials, victories and more else.